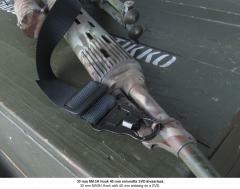 A bloody brilliant attachment hook for slings and straps. 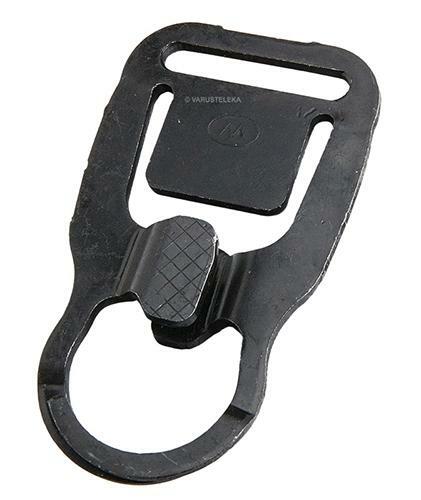 Zero moving or separate parts, stamped from a single piece of steel. The MASH Hook is both incredibly tough and reliable but also very easy and comfortable to use. 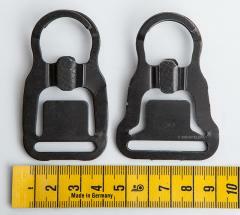 The 30 mm / 1,25" Hook also fits 40 mm webbing pretty darn well, see our photos for evidence! ITW Waterbury Buckle is probably one of the worlds oldest still active metal buckle manufactures, they have been doing their thing since 1835 and are still going strong! As a part of the ITW buckle family Waterbury is the manufacturer of all their high-end metal hardware. Made in the USA! 25mm versio ei mahdu sellaisenaan RK95:n laatikon takareunassa olevaan kiinnityspisteeseen. Vaikuttaa hyvältä hihnalukolta, mutta edellä mainitusta syystä käyttökokemus puuttuu.